So which one did you like best? Let me know in the Comments section below. And if you’ve got a favorite that I’ve missed, post the link! Like latkes, there can never be too many! So that’s the glowing lights taken care of (sort of), now on to sweet little presents. For my birthday this year Ju-Boy gave me an eight session stitch and b*tch at my local pusher — The Gourmet Yarn Shop. We’re working with the book One-Skein Wonders by Judith Durant. So… in spite of the fact that Chanuka weather in Ra’anana is not exactly frosty, I’ve been knitting fingerless mittens for my girls. Each time I start a diet I always like to do it on the same day (Tomorrow). 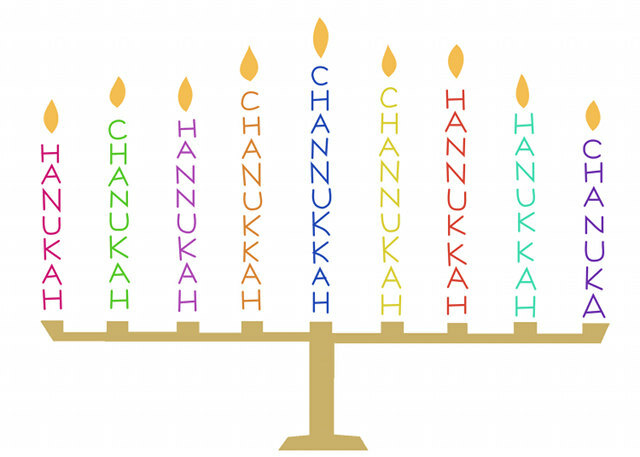 While I do plan to have some fried foods this year (I am rationing myself to one sufganiya, maybe two…), I’m going to be baking latkes for the family in an attempt to keep the calories burning in the candles, not settling on our hips (dream on, Miriyummy, dream on). I grew up eating my mom’s latkes, either fried in butter or in shmaltz. Needless to say, back then my metabolism was a little bit more cooperative than it is today, and I could eat a plateful with impunity, with tons of sour cream (for the dairy version) or sprinkled with salt and black pepper for the meaty version. Pass the applesauce, pass it right by me, none for me, thanks… These days we are all a little more diet-conscious, and Chia’s recipe, originally found here at Recipezaar, may help you believe you are not totally overdoing it this Chanuka. Preheat oven to 220 degrees C (425 F). Drain excess liquid from potatoes. Line two baking sheets with parchment paper and spray them with the cooking spray. Using a 1/4 cup measuring cup, scoop out some mixture and plop it on the parchment paper. Using the bottom of the cup, flatten it into a latke shape. Bake 15 minutes, flip latkes and bake 10 minutes longer. Serve with applesauce (if you must) or sour cream. Posted on 13 December 2011, in Chanuka, Holiday cooking, Jewish cooking, Potatoes, Savory Nosh, Side Dishes, Vegetarian and tagged Chanuka, cooking, fingerless mittens, Fountainheads, Hanukkah, Jewish Cooking, knitting, kosher, latkes, Maccabeats, Matisyahu, one-skein wonders, potatoes, recipe, Recipezaar, side dishes, vegetarian. Bookmark the permalink. 9 Comments. You’re back! We missed you! It’s nice to have been missed! I missed me too! Great post! And the videos were wonderful. Some I had seen (and posted on my fb page) others not. I am a maccabeats fan and love their new video, “Miaracles” but I liked the rap song, too (who would have thunk!). Thanks for posting all of these videos, and I also appreciated the graphic. I had a boss once who got so annoyed with me when he asked me how to spell the name of the holiday and I hesitated because I wasn’t sure what to tell him. 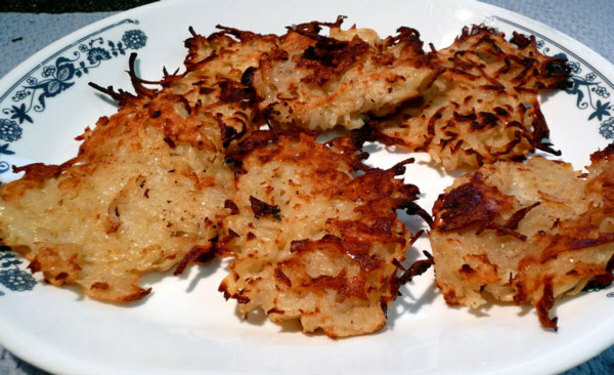 I saw that you posted your mom’s recipe for cauliflower latkes on recipezaar–do you suppose that would work as baked latkes? That would be even easier on the metabolism. No question here-Rocky Horror Chanuka song does it for me. Thanks! Yea you’re back…missed you Mirj!